It is tempting to remain in the 16th century, but finally the Anne Boleyn Files website has come into the 21st century! Yes, the site now works properly on mobile devices – phew! Obviously you could access it before on your device, but it has now been optimised for mobile devices and so is much easier to use and read on the move, or when you just can’t be bothered to switch on your computer. This is all brand new so do let us know if you encounter any issues. It has been tested but you just never know when those pesky gremlins are going to rear their ugly heads! We’ve also ironed out some issues on the Anne Boleyn Files shop caused by software updates (don’t you just love them?! ), so hopefully you’ll be able to put in your Christmas orders without any problem. Again, let me know if you have any problems. 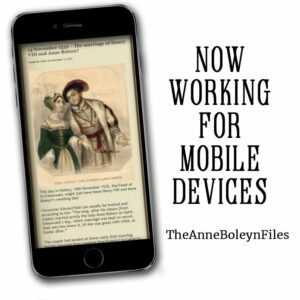 My email is claire@theanneboleynfiles.com. « 14 November 1532 – The marriage of Henry VIII and Anne Boleyn? I noticed the change yesterday. It looked great on my phone. Love the pull-down menu. So much easier. Thank you. A welcome initiative. Thanks a ton Claire.